Being a little less than one month out of Leslie Knoppe’s genius holiday designed to bring all of us gals together now is the perfect time to go ahead and planning a February soiree! Planning a gathering doesn’t have to be a headache or stressful if you prepare in small incraments. A few years ago I threw a holiday party with about 10 gals. It was so fun. We had a wine and cheese theme where everyone brought a bottle they loved. I baked delicious brie and made h’ors douevres for everyone to munch on. Their favor was being able to roll their own chocolate truffles in whatever toppings! It was interactive and gave us all something to sort of bond over. Here are a few ideas if you are toying with the idea of having a Galentine’s Day Party this year. Yes, I know that seems like a lot but these days everyone stays organized a little differently. Facebook is a perfect way to send an evite and a calendar reminder. It’s also a perfect place for someone to quickly reply if they are going or interested. I would personally also give a call or send a text out to your invitees. That makes it easy for them to check their calendar. For a really special touch and a way for your friends to post it on their refridgerator send an actual invitation to them! Although the one I pictured above is for a graduation party, I loved this combination and it’s perfect for Valentine’s Day. You can take a part of a wall or hallway in your home and tape wallpaper or wrapping paper up for the backdrop. Then, simply decorate paper hearts or flowers found a craft stores. A photo area is a great way to encourage everyone to be a part of taking photos. You can also pic up an Polaroid camera for photos to be printed on the spot. One of my pet peeves is looking for someone’s house or a location and it’s difficult to spot. An easy way to help your guests out while getting them into the party spirit is to use balloons to make an entrance. The top picture of this post has golf tees staked into the ground with balloons tied to it. 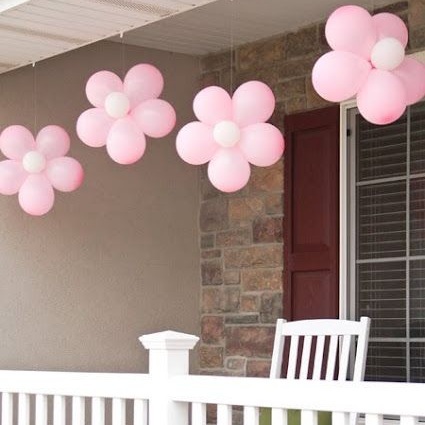 Another way is to create an arch out of balloons or hang them from your front porch. You can add a pretty wreath like this one I’m drooling over from the Martha Stewart Collection at Macy’s on your entrance door to welcome them even further! Probably the easiest way to decorate for any party. Create clusters of balloons and place them in nooks and corners of your space. 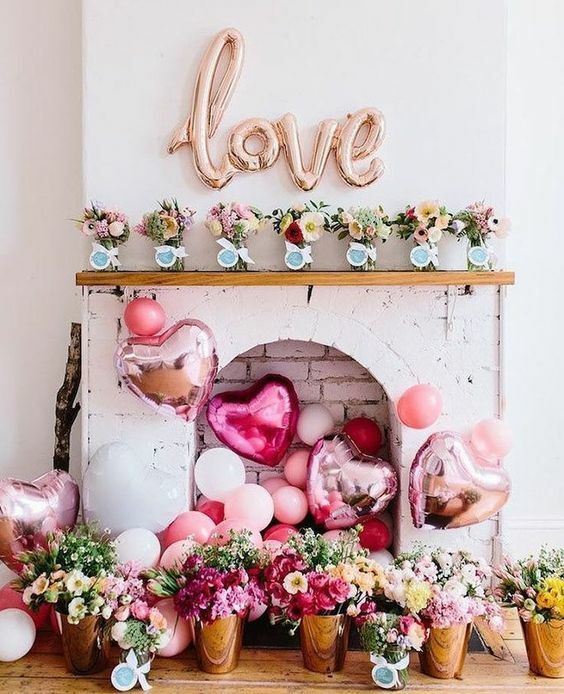 Also grab flowers in pinks, reds and whites in varying heights of vases, cups or tin cans then scatter across tables, bars or other surfaces. If you are considering using a lot of floating balloons rent a helium tank a day or two before and blow them up in advance! Tablescapes don’t have to be too much work. You can set the table with disposable silverware and plates so that you don’t have to worry about a crazy cleanup process. 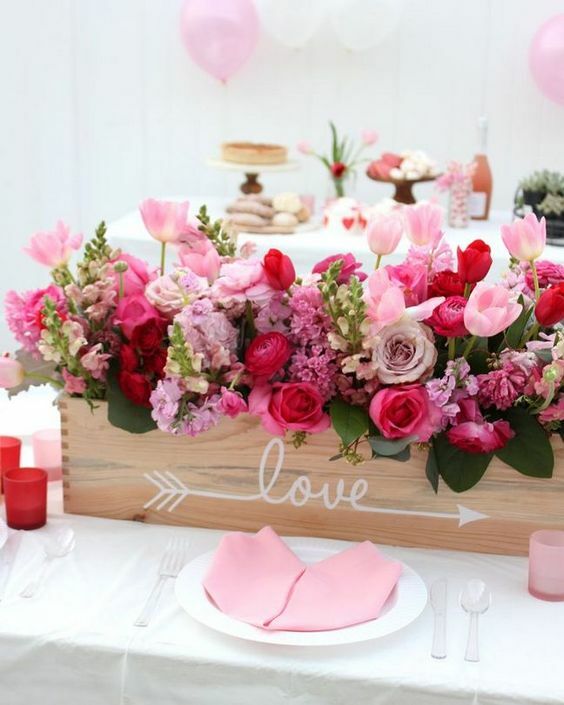 Take wooden boxes and fill with smaller cans of flowers for a really simple centerpiece. Finally, add tea lights for additional ambiance if you are hosting the party in the evening or a darker space. Details make people feel special. Add rose petals underneath a sugar cube to serve coffee.You can toss pop corn in pink sprinkles. I use Pinterest for all sorts of simple things to make a party special. Going the second mile leaves your guests with such good memories and they are likely to inspired by those little touches. This is perfect for them to take home after the gathering is over. It’s so easy to buy a dozen cookies or make your own (I’ve been really into Food Stirs Chocolate Chip Cookies made with all organic ingredients). If you know they are going home to kids or family give them an extra few! It’s so fun to bring home goodies to loved ones. The last part of the evening have a couple of desserts for them to satisfy that sweet tooth. I love the idea above with mason jars filled with ice cream and then you just add your toppings. Another easy dessert just order a simple cake and add a topper. It doesn’t get much easier than that! Whether you are planning a dinner for 4-6 a much bigger gathering get creative to show your guests how much you care. Make sure you send those invites out as soon as you can via text and then send the ones in the mail at the beginning of February. 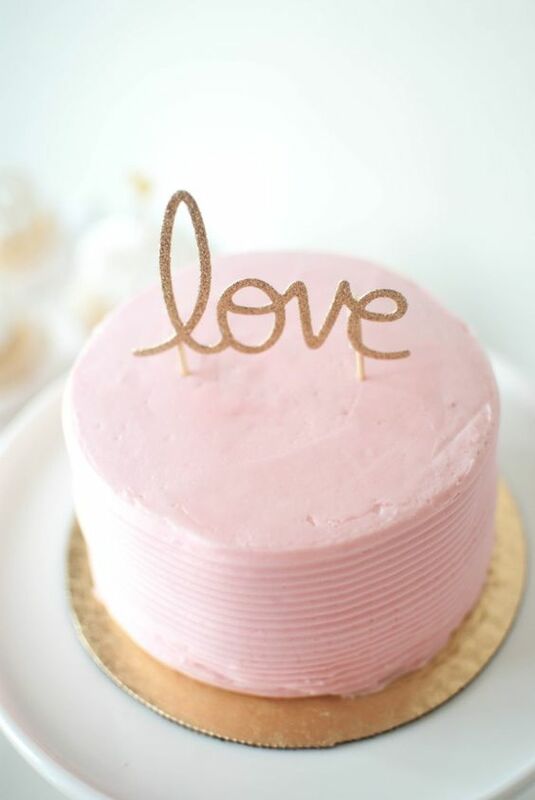 What are some of your Galentine’s Day Ideas?